These free murder mystery games will make sure you have everything you need to throw a murder mystery dinner or party, without having to spend the usual $20-$75 to buy the party kit that you'll probably only use once. These games are good for 6-28 guests, so you should be able to find a great game no matter what the size of your party. Each game includes character descriptions and scripts so your guests will be ready to get into the game. Some of the free games also include free invitations, name tags, props, and more. 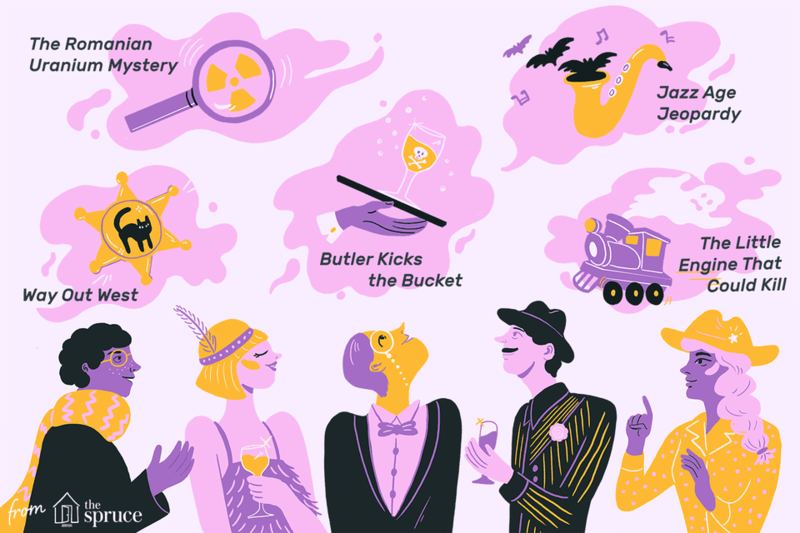 Here are some other spooky party games for adults that you may want to incorporate into your murder mystery party. Sour Grapes of Wrath: This free murder mystery game includes an almost 70-page file that includes planning instructions, party invitations, costume suggestions, name tags, rules, secret clues, maps, accusation sheets, suspect dossiers, and the solution. Free Murder Mystery Game for Tweens: This free murder mystery game is targeted towards kids who are 10-12 year old but I think it would also work well for an adult murder mystery party. This free kit includes a master plot spreadsheet as well as a list of characters. Each guest has it's very own printable party invitation as well as instructions. Props including a sign and birth certificate are also included for free. The Little Engine That Could Kill: This free murder mystery game includes parts for 8 players to figure out who murdered a passenger on the express train from India to Portugal. In-depth profiles are included for each character. The Romanian Uranium Mystery: Here's a very detailed murder mystery game that includes a scripted show, as well as an improved show, that's set around your dinner party. Way Out West: Here's a free murder mystery game that includes the set-up, characters, script, clues, and more. You'll need to subscribe to their free newsletter for the complete package. Harry Potter Mystery Dinner: This murder mystery script is for all the Harry Potter fans out there. Download the free script, character cards, evidence documents, memos, and directions all for free. Jazz Age Jeopardy: Here's a murder mystery that's set in a 1920's jazz club in New York City. The free PDF file includes an introduction, instructions, party guidebook, character sheets, clue cards, and voting sheets. Up to 15 people can play this one. Butler Kicks the Bucket: Download free murder mystery character cards and play the free Butler Kicks the Bucket murder mystery. There are enough cards for up to 15 players. Mafia Party Game: A fun detective style murder mystery game that's for 7-24 players.